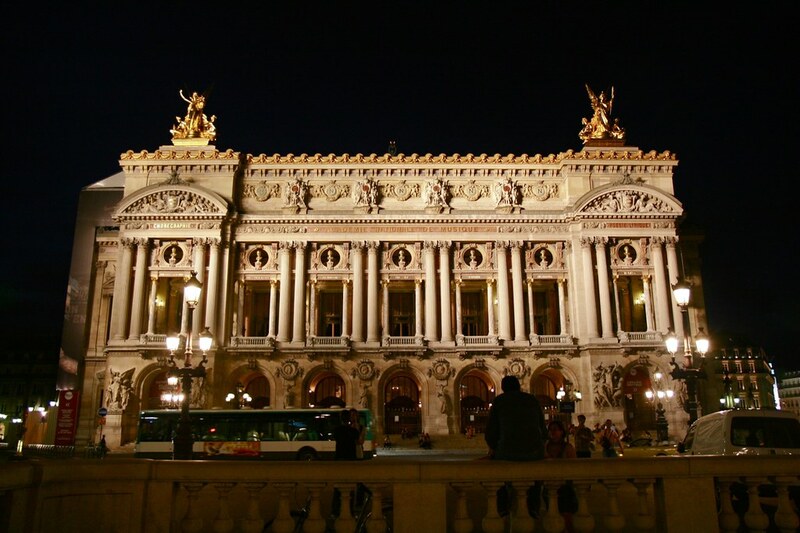 We moved into the Palais Garnier, the original Paris Opera House, yesterday to start our on-stage rehearsals for “La Donna del Lago“, and that burst of excitement of being in such a VERY special theater took hold of me once again, making me giggle and gasp with wonder at all the glitz and gold and gilded centimeters around me. A few of the cast members hadn’t yet performed in this theater and I said, “Have you seen the foyer yet?? ?” Astonished that they hadn’t scrambled into the hallways on the very first break, I immediately said, “Come with me! YOU HAVE TO SEE THIS!” Seeing their reactions: priceless! Now, I’ll admit – this is the part that gets a little boastful, but I can’t help it. You haven’t seen the Garnier unless you can wander those famed marble staircases in utter silence: no tourists around, just you and your wonder as you marvel and take in the vastness of it all. That is a definite job perk – and I treasure it and cannot get enough of it! I still pinch myself when I realize this is where I come to work. As I was leaving the opera house after a long day of staging, I stopped to take a few moments to capture a bit of it with my camera, and it struck me that the modern day world rushes past, in all its fervor and technology and mass transportation, and I often wonder if they know of the magic that can transpire inside those imposing walls of granite and marble. Do they know that for YEARS music has been transporting humanity and bringing beauty and provoking questions before them, trying to help them open their hearts to new levels of understanding? Do they know that cultures are explored and united on that humble stage – which means that true peace actually exists in real time for those fleeting moments? That risks are taken and truths probed so that we might just advance a little bit as human beings? That we might feel a little bit less alone and isolated? Ah, indeed, it is a magical place. And I have to say that this particular building in all it’s over-done glory actually seems to capture the glory and reverence that music and the arts deserve. Across the front of the house are busts of famous composers from Beethoven to Mozart to Halevy (hey, this is Paris – that’s cool! 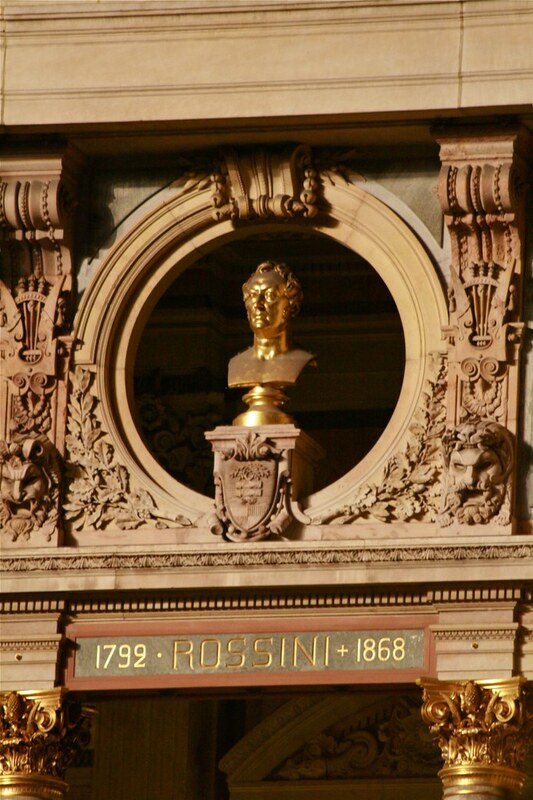 ), and the first one on the left is none other than Rossini, himself. I love the fact that I’m singing my second of his compositions on a stage that bears such beautiful witness to his legacy. It truly inspires awe! I get angry with myself when I forget this most fundamental aspect of WHY we need music/theater/arts, and when I let a multitude of other factors (including myself, sometimes!) stand in my way of expressing this freely. I think the hardest work an actor/musician/performer must face is stripping away all the things that keep him/her from being free to express truth. That can be insecurity, fear, lack of preparation, ego, lack of humility – it can be a million different things. But more than the actual DOING of something, I think it’s the stripping away of those things that keep one from being free which inhibits singers/actors more than anything. It’s why I think being a performer requires an enormous amount of self-discovery and a willingness to look at the obstacles in themselves that inhibit this freedom of expression, and then to try to do the work to bring them crashing down. Ah yes – that’s the key! I’ve got it ALL figured out, so the rest must be all downhill for me, right?!?! Ah, no – sadly, it’s not that easy, and is ALWAYS a work in progress, one that I get to continually agree to face as I try to grow and learn. I know that I’m not the only singer to say, “Why must this career be so hard sometimes?” – but that’s when I come back and think that it’s not a bad thing that we have to earn our way onto the stage and to fight for what our ideals are. No – that can be a wonderfully empowering thing, and it helps us to clarify WHY we do this and what we wish to achieve through our music. It’s funny how a building built over a century ago by complete strangers can still speak to one little singer in 2010, and inspire her to do her very best. Another example of the need for great art in our lives.